A website is not a showcase frozen in time. It must adapt to the evolution of the web, integrate new features, take into account the new standards in SEO, respond to new requests from users … That’s why it is important to redo or modernize its site every 3 years so that it is always current and gives a modern image of your company or your brand. On the other hand, whether it is a total overhaul of the site or major changes, it is advisable to contact professionals who will ensure that these changes will not negatively impact your traffic and are properly performed. Our website redesign services have already made many site redesigns that have resulted in increased traffic and conversions. Why Modernize Your Website With Best Responsive Web Design Company in India? It must meet the expectations of users: for this, it is important to study their behavior: how did they arrive on the website? Did they stay there? What pages did they consult? Did they buy a product, download a document, and fill out a sharing form? The answers to these questions may give clues to the pages to be reworked and the content that the site must offer. Indeed, if users do not stay on your site, if they do not order anything or do not contact you following their visit, it is because your website does not meet their expectations, does not fulfill its purpose. Internet changes very quickly. New features appear regularly. Other technologies are declining. There are also fashion effects that make a site trend and another has been. This impacts the image given by your company or brand. The algorithm used by search engines is changing and is becoming more and more pointed. It is important for your website to incorporate the latest developments to maintain or get a good position. A good job of SEO starts with an optimized website that meets the latest standards in SEO. 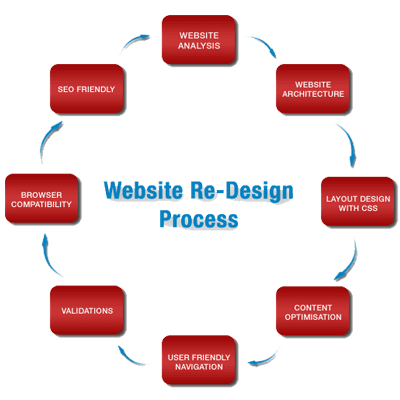 Why Choose Us For Website Redesign? Before any redesign of a website, responsive web design company in India team will conduct a thorough and detailed audit of the current site. This work will allow our web agency to understand what is wrong and what works on the site. It will cover both the architecture of the site, its technical characteristics, its content but especially the behavior of Internet users: from their arrival mode on the site to their departure. A good site is a site that attracts qualified traffic and gets a lot of conversions. There is no point in making a public site. During the redesign, it is necessary to aim to attract only a targeted audience that is, people who are really interested in the services or products you offer and not people who come here by chance and leave without buying anything. When redesigning a website, we take this opportunity to integrate social networks in your approach to visibility on the Internet. We take care of all the “technical” consequences related to the disappearance of certain pages, including 301 redirects and 404 errors.